Grant McDonald was born in Grand Forks, British Columbia on 20 July 1921, the second youngest of the seven children of William and Florence McDonald. His father worked as a carpenter. He went to school in Grand Forks. By the time he left, the war had already started and he applied to join the RCAF. At that stage it was not accepting new recruits, so he went first into the Canadian army, but was able to transfer to the air force a few months later. After training in Canada as an air gunner, he crossed the Atlantic on a troopship in May 1942. After more training at a gunnery school near Stranraer, he was posted to No 19 Operational Training Unit at Kinloss, where he first crewed up with fellow Canadians, Ken Brown and Stefan Oancia, and then the Britons Dudley Heal and Harry Hewstone. Their first operations were a number of anti-submarine patrols from St Eval in Cornwall, but they were then transferred to a Heavy Conversion Unit for Lancaster training. Here a full crew of seven was formed, with flight engineer Basil Feneron and gunner Don Buntaine joining them. They were posted to 44 Squadron in February 1943 and had only completed a handful of operations before being transferred to the newborn 617 Squadron at the end of March. They were directed to the Sorpe Dam, and attacked it at 0323. After flying across the width of the dam, they dropped their mine in the middle and it exploded satisfactorily, sending a waterspout many hundreds of feet into the air. The dam, however, remained intact. Before leaving the area, AJ-F took a detour to the rapidly-emptying Möhne Dam and were impressed by the damage that their comrades had done a couple of hours earlier. One of the anti-aircraft guns was still operating, however, and McDonald opened fire on it, ‘really giving him hell’ as Brown later recalled. McDonald himself thought that his .303 guns might not have had enough firepower to cause permanent damage. Thanks to Brown’s skilful low flying they finally landed safely at Scampton at 0533. McDonald flew with the Brown crew on all its subsequent operations in 617 Squadron, leaving when the crew was broken up in March 1944. He was then posted as an instructor to an OTU in the summer of 1944. On being demobbed at the end of the war, he joined the Canadian customs service in Vancouver, the same occupation as his sometime crewmate, Dudley Heal. He married Margery Warrian on 30 July 1948. They had no children. 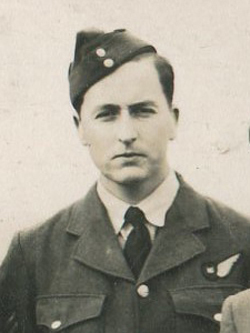 As one of the last surviving Dambusters, Grant McDonald participated with courtesy and dignity in a number of events in both Canada and Britain as the various anniversaries of the Dams Raid came about, but he died three days before its 69th anniversary. Grant McDonald died on 13 May 2012 in Vancouver. Thanks to Karen and Bryce Ramlo for help with this article. Survived war. Died 13 May 2012.